“With a Cigarette in hand, he felt like a man, with the cigarette in his hand he was actually a dead man"
Short yet so true, cigarette smoking is more of a fad rather than a habit or a necessity. The pack of cigarette mandatorily carries the statutory warning saying that cigarette smoking is injurious to health, how injurious no one bothers to find out. If only people who blow off the smoky curls in the air realized the harm that cigarette smoking might or actually cause to them, then it would perhaps not even take a second to distinguish what’s good and what’s not. To quit smoking requires a skillful blend of awareness- about the bad effects of smoking, with a bit of courage to give up the so called habit, and lots of conscious effort to pop in the pipe every now and then. There are several ways to get rid of this abominable habit, but the big question is which ones will succeed in actually helping an individual to quit smoking and overcome the physical as well as psychological starvation that may accompany the process. The nicotine that flows into the body has a tendency to cure temporarily the feelings of loneliness, sadness, stress, anxiety and depression. This can however be also managed by using healthier options such as by meditating, practicing breathing exercises, exercising. 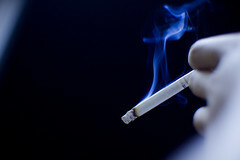 For people who smoke cigarette seems to be the only savior in times of despair or tension. But an effort to quit smoking requires that one should switch to alternatives in order to handle these difficult moments. It is better to handle stressful situations independently without taking resort to smoking. To quit smoking it is important to learn how to manage the stress yourself and designing a game plan to improve self confidence even without the cigarette. Thinking about the positive aspects of not smoking like bringing down the risk of cancer, stroke, heart attacks saving some money, reducing the dangers of smoking for the passive smokers in family are few of them. For smokers ending the meals means smoking, it would be a good idea to replace that moment with a piece of fruit or a chocolate. Moreover social smoking also tempts a determined quitter to pick up the habit again, thus social circle should well in advance know that you are trying to quit smoking, and that they should not smoke in your presence. Staying active and occupied, by exercising or walking is a good way of doing away with the addiction. Smoking sometimes becomes instinctive, whenever a person is free he pops in a cigarette, so keeping hands busy by squeezing balls, playing etc would help. The final step to quit smoking would be to decide a date for the mission and maintain a journal about the kinds of cravings you face in the process and how you tackled it. A few notes will serve as another substitute to spend time and distract oneself from smoking. These tips will surely help one to quit smoking successfully and adopting a fresh healthy lifestyle.